One conclusion is evident: as the so-called Ecclesia Dei communities have preserved “their spiritual and liturgical traditions,” they clearly do not count in this discussion. If they remain attached to a section of the Congregation for the Doctrine of the Faith, it is incidental. They can have the Mass, the “spiritual and liturgical traditions,” but not the whole doctrine that goes along with them. That has always been the Society of St. Pius X’s great reproach against Dom Gérard [Calvet] and all those who thought they should break the unity of Tradition in order to negotiate a purely practical agreement. The crisis of the Church cannot be reduced to a spiritual or liturgical question alone. It is deeper, for it touches the very heart of the Faith and the doctrine of Revelation, Christ the King’s right to reign here below over men and over societies. This statement is curious, to say the least. If the liturgy really is the primary theology of the Church and we truly believe the axiom lex orandi, lex credendi, then maintaining the usus antiquior and the ascetical-mystical spirituality that sustain it is, in practice, already to maintain “the very heart of the Faith and the doctrine of Revelation,” which, incidentally, includes a primacy of honor and jurisdiction on the part of the supreme pontiff. In fact, everything Catholics believe — including “Christ the King’s right to reign here below over men and over societies,” which is not at all clear in the reformed liturgy  — can be directly deduced from the preconciliar Roman liturgy that all “Ecclesia Dei communities” treasure. I do not and would not criticize the judgments of conscience that led to the founding of the FSSP in July 1988; good-willed Catholics have disagreed and will continue to disagree in their interpretations of Archbishop Lefebvre’s dramatic step, but there is no question that he freely acted against the provisions of canon law and a solemn papal injunction to desist. If one is given the option, one should attend an usus antiquior Mass offered by a priest in “good standing” with the Church — while recognizing that, in the current crisis, “good standing” often doesn’t mean very much in practice. It is disturbing to see the one priestly Fraternity attacking, or speaking dismissively of, the other. I understand why this happens, as there are serious issues at stake; but it still leaves me wondering if they realize the direness of an ecclesial situation in which “all hands on deck” should be the prevailing motto. Laity, in my experience, have a stronger sense of the importance of being flexible and “tradumenical” in this cancer phase of the postconciliar disease. We might ponder a divine irony in the Fraternities’ very names, which suggest two faces, like that of the ancient Roman god Janus. First, the Priestly Society named after St. Pius X. Every Catholic admires Pius X for his authoritative condemnation of Modernism, that “synthesis of all heresies,” and his vigorous (although unfortunately unsuccessful) efforts to suppress the Modernists; for his unequivocal condemnation of the principle of the separation of Church and State in his encyclical Vehementer Nos; for his promotion of Gregorian chant in Tra le Sollecitudini and his condemnation of the use of pianos in church, which is still in effect, although often ignored; for his encouragement of a lower age for first communion and of the practice of frequent communion for the well-disposed. However, there is one blotch on his papal escutcheon: the violence he did to the Roman Breviary with his radical reforms of 1911. Many popes have added this or that small feature to the liturgy — a new feast, a new preface, a new octave, the prayers at the foot of the altar and the Last Gospel; many have modified the rubrics; very occasionally they have pruned elements deemed overgrowths, such as Pius V’s removal of certain obviously legendary saints from the calendar of the 1570 Missale Romanum. But never had a pope dared to alter in such a radical and thoroughgoing way any of the Latin Church’s ancient liturgical offices. 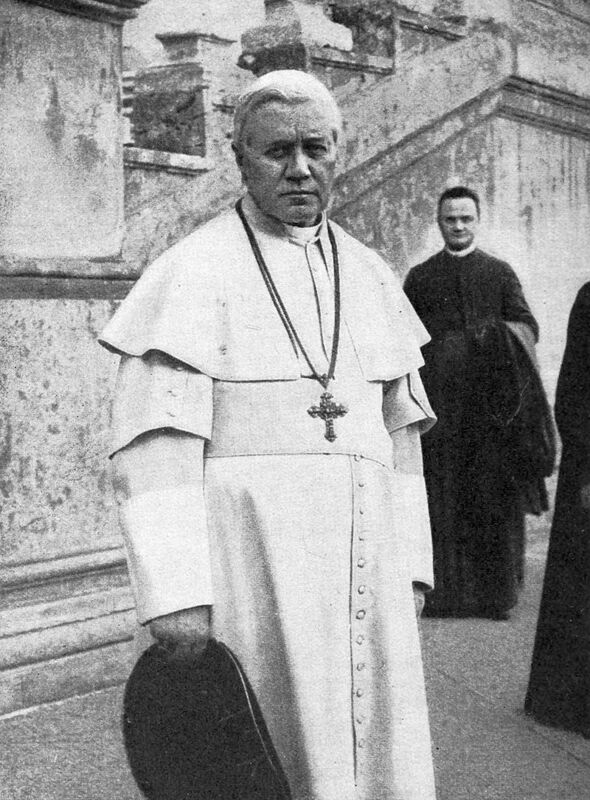 When Pius X had the Breviarium Romanum dismantled and reconfigured in the early 20th century, he was not merely setting aside something that had been constructed in the 16th century, as liturgists can be found to assert; he was altering a rule of prayer so old its origins cannot be discerned. Indeed, there is strong reason to think that the daily recitation of the Laudate psalms (148–150), from which the very hour of Lauds derives its name, is traceable to the Jews of the time of Christ and therefore, with great likelihood, was practiced by Our Lord Himself in His prayers on earth. Thus, the very saint to whom the SSPX is dedicated shows us two sides in tension: the zealous promoter of Catholic dogma, and the larger-than-life pontiff who treated part of the liturgy as if it were a mechanism to be rebuilt rather than a living organism to be nurtured or an inheritance of the saints to be treasured. The heavenly patron of the Priestly Fraternity of St. Peter also offers us two sides in tension: the Peter who confessed Christ as the Son of God and received the keys of the kingdom of heaven; and the Peter who tried to remonstrate with Christ’s folly and received His rebuke: “Get behind me, Satan.” We see in the New Testament the Peter who preached the first homily on the first Pentecost and won over thousands of souls to the Church; we also see the Peter who, from human respect, denied his Master in the Passion, and later declined to associate with Gentile converts, for which he merited the sharp rebuke of his fellow apostle Paul. As Joseph Ratzinger pointed out in his book Called to Communion, the long course of Church history has displayed both faces of Peter, when his successors have acted as a stable rock of doctrinal orthodoxy and sure-handed governance, or as men acting on their own fallible initiative, ambitious, worldly, profligate, compromising. 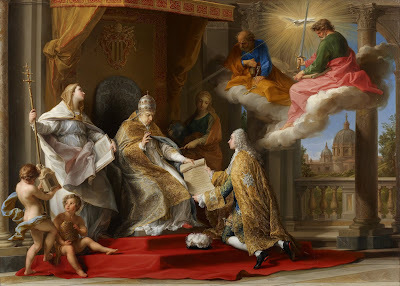 Leaving aside this pervasive duality between office and incumbent, we may say that the patronage of St. Peter is likely to take one of two forms in the Catholic Church of the Tridentine and especially post-Vatican I period. The saint can symbolize either adherence to authentic apostolic tradition, which will pit him against Protestantism and its offspring in matters of dogma, ethics, and worship; or he can symbolize the spirit of ultramontanism — a false exaltation of the pope, a papal personality cult, which some have named hyperpapalism or papolatry. Manifestations of contemporary ultramontanism can be obvious or subtle. For obvious manifestations we need only look to the circle of sycophants who applaud a pope’s every word and gesture. For a subtle manifestation, consider the defeaning silence on the part of many traditionalists to the pope’s most appalling statements and actions; the desire to project an image of “toeing the line” in public, while rejecting it in private. One understands why, in a time of persecution, members of traditional religious communities would keep their lips sealed, for fear of reprisal; but one would think that, out of self-respect, members of such communities would then refrain from speaking against Catholics who do raise their voices to protest open deviations from dominical, apostolic, and ecclesiastical tradition. The irony, then, is that one community, which has fallen out of favor with the popes on account of its outspoken battle against modernism, is dedicated to a pope who was himself both an anti-modernist and, in a way, a proto-modernist; while another community, which has always retained papal favor on account of their willingness to refrain from explicit criticism of any pope, is dedicated to the first pope, who was himself a rock of faith and a stumbling block, and has become, in our times, a symbol claimed for the permanent charism of truth as well as for the pseudo-charism of fiat voluntas mea. These sobering reflections, it seems to me, should prompt in everyone — whether persevering quietly under the patronage of the Church and the tiara of Peter, or fighting manfully on the open field while bleeding from the wounds of irregularity — a deep humility in thanking God for any and all of the gifts He has given to tradition-loving Catholics in this time of ever-intensifying spiritual warfare. It is a time for making alliances on behalf of perennial doctrine, sound morals, and authentic liturgy, not for waging battle on two fronts. See this article and this article for a further explanation of how the new (post-Paul VI) version of the feast of Christ the King differs notably from the preconciliar one of Pius XI. Thus, we are not surprised in the least to find certain original members of the FSSP, who were once under the wing of Archbishop Lefebvre, praising him for his “pastoral approach” to liturgy. They use this to justify aberrations like reciting the readings in the vernacular facing the people instead of chanting them in Latin facing eastwards or northwards at a Missa cantata or even a Missa solemnis. “Pastoral,” indeed — so reminiscent of the aspirations of Jungmann, Parsch, Bouyer, Bugnini, and countless others whose cumulative “pastoral wisdom” birthed the Novus Ordo Missae in all its celebrated pastorality. See Addendum below, added February 5, 2019. The claim that Pope Pius V “removed lots of sequences” is something of an urban legend. With classically Roman conservatism, the Missal of the Roman Curia, the medieval predecessor of the Missal of St Pius V, simply had not received many sequences to begin with. After 1570, as churches passed over from their own local uses to that of Rome, they dropped the sequences because they were not in the Roman book. The same thing happened with some who, though retaining their proper uses, like the Premonstratensians, recast them in imitation of the Roman Missal. By “papal constructivism” I mean a Cartesian attitude of technē whereby the pope sees himself as the “master and possessor” of the liturgical rites, losing the attitude of profound piety towards the family inheritance. The reform of the breviary under Pius X, in 1911, was unfortunately also a revolutionary reform. It is for me an enigma how he could do this, Pope Pius X, because he changed completely the entire structure of the psalm distribution, which the Roman Church kept almost inviolably since the times—even before—of Pope Gregory I. So, already from the 6th century, maybe even earlier, the Roman Church had from this time, substantially, through at least 1,300 years, always kept the order of the distribution of psalms in the breviary during the week. The order of psalms was called the cursus romanus—cursus, meaning the course or sequence: the psalms are running through the week, from Sunday to Saturday. It was very harmonious, very logical, when you observe it. And Pius X completely, radically, changed the entire distribution of psalms. It never happened thus in the Roman Church. This is for me an enigma. How could he make such a revolution? Of course, he had some pastoral motives about unburdening the secular priests, to lighten their burden. But this could be done in a way not touching, substantially, the order of psalms, which the Roman Church always kept. The problem was Matins, because it had 12 psalms in the weekly office, and for some diocesan priests it was too much. The pope could have avoided touching the cursus romanus psalmorum and allowed the diocesan priests to pray maybe only half of them, six for example. So Matins would already be lightened. But the religious priests and the nuns who have to pray as their first duty, they would pray all of it. Unfortunately, the pope changed everything, even for the nuns and for all religious, maybe with the Benedictines as the only exception, who were allowed to keep their traditional psalmody. So I repeat: it would be sufficient to make a provision specifically for the clergy who are in pastoral work to lighten the burden of praying the amount of psalms, without changing substantially the order or structure of the millennium-old Roman liturgy of the Divine Office. I hope that in the future, the Church will return to the traditional Holy Week, pre-‘55, substantially, maybe with some slight modifications that will not touch the substance. And the same with the breviary—to return to the pre-Pius X breviary, which I call “The Breviary of All Ages,” with maybe some modifications that would be reasonable. But I repeat: not touching the substance of it. I shall repeat: the Church has to do all these things very carefully, and she had always done this wisely in the past. The popes have to be conscious that they are not the owners of the liturgy and the rites, but the keepers and the guardians of them. Several have written to me to say that +Lefebvre decided to make the 1962 books binding simply because they were the last editio typica promulgated by lawful authority, prior to the devastations unleashed by the Council. The Instructions of 1964 and 1967 were not to be followed because they expressly referred to Sacrosanctum Concilium, of which Lefebvre had become skeptical (although a signatory in 1963), and especially because they implemented the program of the Consilium. It is possible that +Lefebvre -- like Pope John XXXIII himself, who still celebrated the Liturgy of the Presanctified Gifts even after his predecessor had abolished it -- would have preferred the pre-1962 rites, but he saw that he, as bishop or superior, would not have the right make such a momentous choice on his own, and that it would have obscured his position on the papacy. Again there is a certain irony here: the very proximity of the “Ecclesia Dei” communities to their Roman contacts (which is considered “selling out” by their critics) has permitted them to acquire the right to use the older (pre-Pius XII) form of Holy Week, whereas the SSPX, standing at a greater distance, is canonically helpless in this regard. They could at some point formally request the right to revert to an earlier edition of the missal, but given the sensitive nature of the doctrinal dialogue, this issue would naturally tend to be lower down on the list. As Fr Hunwicke recently pointed out, our liturgical hindsight is 20/20. In the 1950s and even through the 1960s, the trajectory from Pius X’s breviary to Pius XII’s Holy Week to Paul VI’s Novus Ordo was not clear to most observers. At the time, +Lefebvre and others may have considered all of Pius X’s actions mantled in his sanctity, and all of Pius XII’s reforms to have been moderate and worthy of acceptance. It was only subsequently, when the full horror of the constructivism, presentism, utilitarianism, rationalism, and papal voluntarism of Paul VI’s “reform” became apparent, that a more comprehensive critique of the 20th-century reformist program began to emerge. Today, this critique is increasingly widespread, but in 1965, 1970, or 1975 one would have looked for it largely in vain.